in Emotions of Normal People. This same William Marston was also the original creator of the Wonder Woman comics and the creator of the systolic blood pressure test used in an attempt to detect deception, which became one component of the modern polygraph. 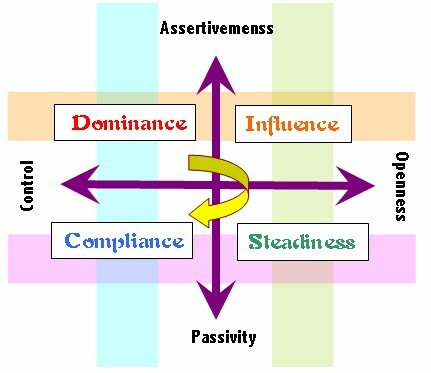 Marston developed the four quadrant behavioural model to examine the behaviour of individuals in their environment. It focuses on the styles and preferences of such behaviour. A Harvard graduate in psychology, Marston was a consulting psychologist, researcher and author or co-author of five books. Walter V. Clarke established his own business in 1948, in order to utilise the years of development and research he had undertaken. He believed that it was possible with a high degree of accuracy to determine and predict the long term behaviour of an individual based upon a set of questions. With Marston, he named four vectors of behaviour: Assertiveness, Sociability, Tranquility, and Dependence. Together, they developed the criteria to ascertain the conditional likelihood of a person to behave according to these predictive scales. Their system allows that all individuals possess all four behavioural traits, but what differs from one to another is the extent of each. There is always an interplay of behaviours, known as ‘blends’. Each ‘blend’ starts with a primary type, followed by a secondary type, and all four types contribute more than just the strength of that ‘signal’. High Scorers: actively deal with problems and challenges; considered demanding, forceful, egocentric, strong willed, driving, determined, ambitious, aggressive, and pioneering. High Scorers: influence with both talk and actions and tend to be emotional; convincing, magnetic, political, enthusiastic, persuasive, warm, demonstrative, trusting, and optimistic. High Scorers: want a steady pace, security, and do not like sudden change; calm, relaxed, patient, possessive, predictable, deliberate, stable, consistent, and tend to be unemotional and poker faced. High Scorers: adhere to rules, regulations, and structure; like to do quality work and do it right the first time; careful, cautious, exacting, neat, systematic, diplomatic, accurate, and tactful. Most of these articles will emphasise the value of DISC profiling in the context of business. Many of the comments, however, are readily translatable into terms relevant to home educators. Don’t be perturbed by the business-orientation, but keep your own purposes in mind as you read. This was the only genuinely free online DISC test that I was able to locate at the time of writing this article. Many search results promised to be free, but weren’t. This changes often, as search engines locate different or better resources, so your own internet search may well yield something worthwhile. Please contact us if you locate something reliable. successful personality and duplicate it.